This publication has been a reliably anti-Trump voice on most major debates and happenings. From Muslim bans to anti-worker NLRB appointments, tax cuts for the rich to the war in Syria, we have featured explicitly partisan coverage of the latest in the Resistance to Trump. But sometimes, a particular act can be so egregious that it matters for history to pause a moment and state unequivocally where you stand. 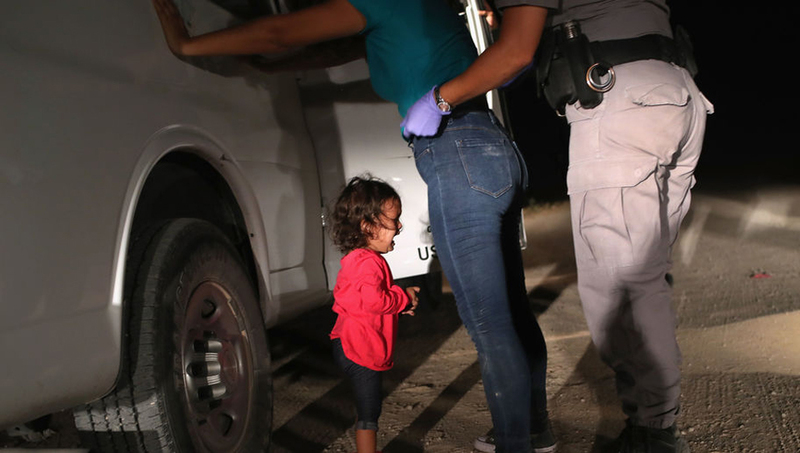 The Trump-Sessions policy of kidnapping migrant children from their parents at the border is just such a moment. By now, anyone who’s paying attention will have seen the first images and descriptions to seep out from inside the Trump camps. Some 1,500 teenage boys are confined in a former Walmart store in southern Texas, provided two hours a day of sunlight and two phone calls a week—an experience more resembling a protocol for inmates, not child detainees. Not far away, a warehouse divided up into cages by crisscrossing chain-link fence holds hundreds more kids. There, young girls are struggling to teach themselves how to change diapers and care for babies taken from their parents and dumped in with them. And now, as of last Friday, there are “tent cities” on U.S. military bases. Constructed to hold the overflow of stolen children, they are veritable concentration camps in the 100-degree Texas heat. These are just those facilities that we know about so far. There are many more, and the conditions in them remain unknown. Whether there are appropriate psychological, medical, and counseling professionals is also unknown. 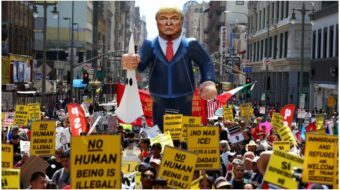 Opposition is rapidly growing to the Trump administration’s so-called “zero tolerance” policy, which targets every person crossing the border without documents for immediate criminal prosecution. 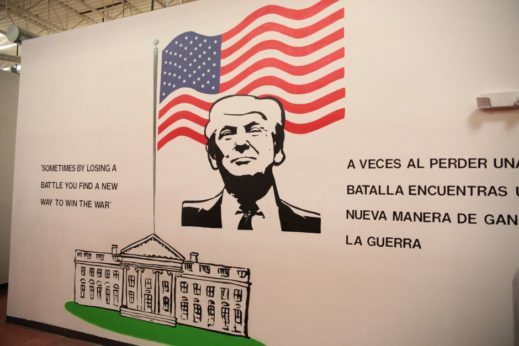 Under U.S. law, minors cannot be thrown in jail with arrested parents, hence the Trump detention camps. 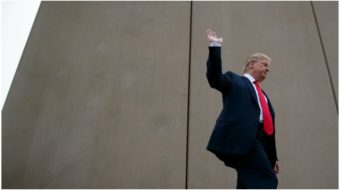 Trump himself, Jeff Sessions, Sarah Huckabee-Sanders, Kellyanne Conway, and the rest, in an act of supremely unconvincing political acrobatics, are trying to spin their kidnapping policy as the result of the Democrats’ failure to address the supposed “immigrant crisis.” Claiming that a policy which started in April is somehow the fault of the opposition party when Republicans control the entire U.S. government is the apex of absurdity. Trump is calculating that his policy—the ultimate “tough on immigrants” image—will score points with the (white) electorate and guarantee a victory in the midterm elections. He’s still following the approach of his former political advisor, the white supremacist Steve Bannon, who says he shouldn’t make any deal on immigration reform, lest he look weak in the eyes of his base. So far, however, the whole affair appears to be backfiring. Evangelical leader and longtime Trump backer, the Rev. 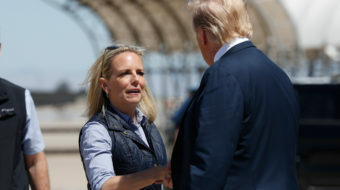 Franklin Graham, has publicly called the president’s child-snatching “disgraceful.” Other faith groups, including ones reliably conservative, are pushing their ally in the White House to back off. They, too, are no doubt disturbed by Sessions’s quoting the Bible to support the administration’s policies, a verse, however, that merely says people should obey government decrees. Theologians and other religious folk respectfully cite many other Biblical passages which, to the contrary, call for resistance to unjust laws. The sight of children in cages is splintering the GOP internally, as well. Sen. Susan Collins of Maine, never seen as weak on immigration, denounced the policy, saying it’s “traumatizing to the children who are innocent victims” and that “it is contrary to our values in this country.” Someone might remind her of the history of Indigenous children ripped from parents and sent off to boarding schools or of African children stolen and sold during hundreds of years of slavery. Unfortunately, acts like Trump’s are not unprecedented in our country’s history, but Collins’s opposition is welcome just the same. In the meantime, while Trump plays electoral games and strokes his strongman ego, the children who are his political hostages suffer the consequences. The trauma of being separated from their mothers and fathers by force, even if they are someday reunited, will undoubtedly leave long-term emotional and mental scars. And there is the question of whether the U.S. government will even be able to keep track of the thousands of children it has imprisoned and parceled out to camps, empty discount stores, warehouses, and foster homes. Some of them have already “gone missing” from the records. A government that rips a suckling infant from her mother’s breast while spouting Biblical justifications for such cruelty is not a legitimate one. Whatever claims to authority the Trump administration made after its electoral college victory in 2016 are certainly empty ones by now. 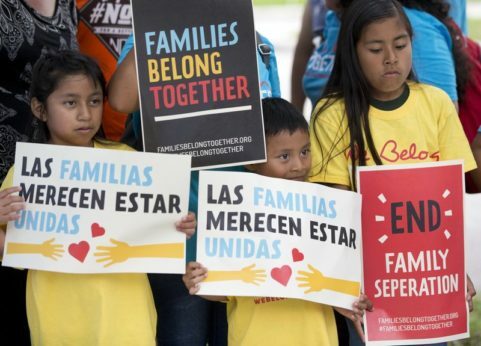 We encourage all our readers to oppose Trump’s kidnapping and child imprisonment and to check out the actions being organized by the Families Belong Together coalition. Join a demonstration, sign a petition, call your elected officials. Historians will one day condemn this government when they write the story of our time. Lest the American people not be condemned along with it, they must act to stop this barbarity and remove it from power—first in November 2018 and on through to 2020. Like free stuff? So do we. Here at People’s World, we believe strongly in the mission of keeping the labor and democratic movements informed so they are prepared for the struggle. But we need your help. While our content is free for readers (something we are proud of) it takes money — a lot of it — to produce and cover the stories you see in our pages. Only you, our readers and supporters, can keep us going. Only you can make sure we keep the news that matters free of paywalls and advertisements. If you enjoy reading People’s World and the stories we bring you, support our work by becoming a $5 monthly sustainer today.